As I opened the New York Times on January 26, 2010, I was excited to see an article about how the Beijing Municipal Archive (BMA) had opened sixteen new volumes of files dating from the Cultural Revolution period. I shared the journalists’ happiness at increased official openness, but I was surprised that they did not seem to realize that vast quantities of rich archival material from the Cultural Revolution have been publicly available for more than a decade. As government, state-owned, and collective work units have disbanded, reorganized, or relocated in recent years, reams of files dating from the Mao era have found their way to antique markets, used book markets, and online sellers throughout China. The most important ingredients of successful flea market research are to make personal connections, to stay persistent over many months and years, and to be flexible and ready for change. After poking around the huge Panjiayuan market in Beijing once or twice a month when I was studying Chinese at Tsinghua University in 2001, I got serious about digging up documents as a graduate student. I began by wandering around Tianjin’s famous antique market (at Shenyang dao and Shandong lu). When I was paging through a small pile of Red Guard newspapers, a man approached and asked if I was interested in Cultural Revolution materials. When I said yes, he replied, “Follow me.” We walked to his nearby home, and three hours later I left with a box containing most of his supply of Red Guard criticism leaflets (from 1966 and 1967), plus his entire pile of official policy documents from the Tianjin Revolutionary Committee (from 1968 through the late 1970s). The three hours ended up yielding far more useful research material than the three months I spent at the Tianjin Municipal Archive. When I returned to Tianjin for a conference in summer 2006, Sangong was closed for renovation, and another book market had been torn down. I called a bookstore owner and learned that the weekend markets had consolidated and moved to Ancient Culture Street (古文化街, near the intersection of Dongma lu and Beima lu). All of my peddler friends were there, and I found great material when I returned in summer 2009, but in August 2010, peddlers told me that a team of officials had recently toured the market with a television crew in tow. Apparently there had been a crackdown on the circulation of documents, but it had only been partially effective. Peddlers simply hid stacks of Cultural Revolution documents underneath prominently displayed used books. Things change fast, so find what you can when you can. 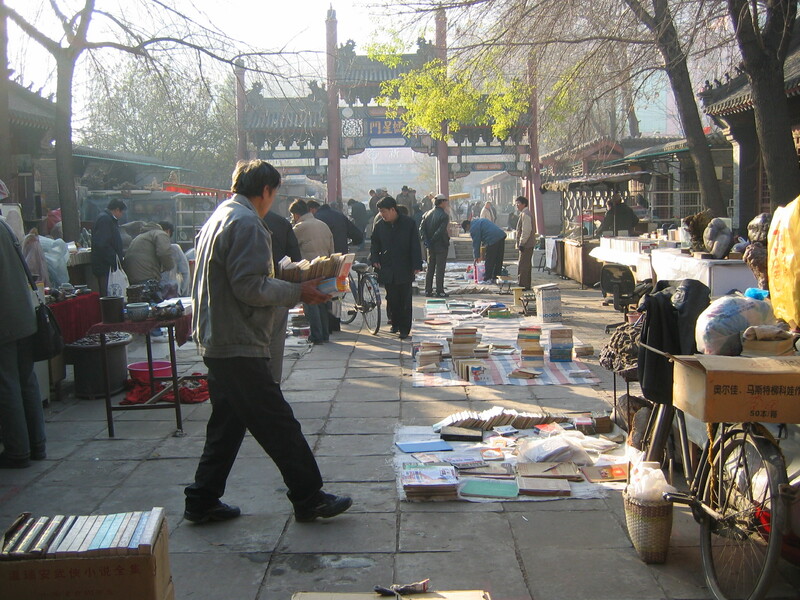 Some of the vendors at used book markets also offer items online via the Confucius Used Book Network (孔夫子旧书网, www.kongfz.com). In 2005, one seller told me that the only material he was not allowed to list online was Falun Gong literature. 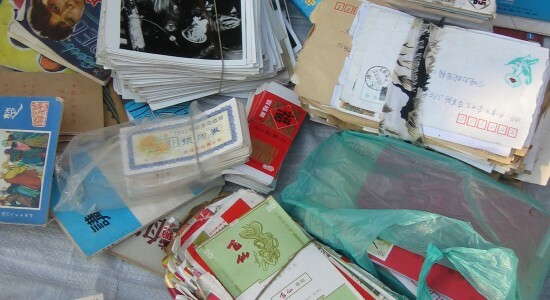 In 2009, vendors on kongfz.com listed thick dossiers of files related to rural class status investigations from the Four Cleanups campaign in 1965 and 1966. But according to my contacts, authorities have cracked down on the online document trade. The Confucius Used Book Network is still a great source for old books, but it is now more difficult to find archival files online. Because flea markets are an unconventional source for historical materials, it makes sense to ask: How do we know that the documents are authentic? How can we use them effectively? But we should ask such questions of all historical sources, whether they come from a state archive or an antique market. Much of the material I have seen in flea markets looks, feels, and smells similar (and in some cases, identical) to files from county or district (qu) archives, and to Mao-era dossiers held in the storage rooms of village party committees. The paper is the same color and quality, bound with string in 1960s or 1970s-vintage file folders, and cadres have signed off on documents with round, red stamps. Just like files held in county and district archives, flea market documents show how the state’s grassroots organizations, including urban work units and neighborhood committees and rural party branches and work teams, interacted with city residents and villagers. Regardless of the provenance of such grassroots documents, it is near impossible to use a handful of dusty dossiers to build a broad historical argument or to claim that a local example is representative of a wider trend. Documents from flea markets and county archives must be supplemented and corroborated by other sources, including officially published materials like gazetteers and chronologies, memoirs, and oral history interviews. For example, one of my most valuable finds at Sangong was a thick dossier of files related to employees of a single Tianjin work unit who had been deported (qiansong 遣送) to the countryside during the Cultural Revolution. Before seeing the files, I had heard about Red Guards driving people out of large cities, but I wrongly assumed that Red Guards were acting on their own or choosing their targets randomly. I had no idea that city officials had sanctioned and managed a complex program to punish “ten types of people” (shizhongren 十种人, alleged enemies of socialism and other people with political or behavioral problems) by forcibly deporting them to villages. The initial dossier made it possible for me to focus an entire chapter of my manuscript on the deportation program, but it was only a start. Officially published gazetteers specified how many Tianjin residents had been deported (41,571, or 1.28 percent of the city’s population). A CD-ROM database of Cultural Revolution documents confirmed that officials in Beijing had approved of and explained the rationale for deportations nationwide. I found other loose documents elsewhere about deportation, including transcripts of speeches by Tianjin leaders in charge of the program, policy guidelines issued by the Tianjin Revolutionary Committee, and reports from city work units explaining how they dealt with troublesome deportees. Finally, I interviewed people who had been deported. By itself and divorced from national and local policy, the dossier of individual cases was almost meaningless and unusable. In order to make sense of the stories in the files, I had to look elsewhere for the broader context. But at the same time, had I only focused on deportation policy and omitted the experiences of deportees, I would not have been able to grasp the human cost of the deportations. On four occasions when reading the files of deportees, I literally shed tears and pounded my desk in anguish. A scribble at the end of each file indicated that most deportees had been permitted to “return to Tianjin and regain their job” (fan Jin fugong 反津复工) at some point in the 1970s or early 1980s. But four of the files had a quite different final notation: on such and such a date, the deportee had committed suicide. As I approached the last page of each file, learning each individual’s life history and discovering why he or she had been expelled from Tianjin—often for trivial workplace conflicts, adultery, or trading food on the black market during the early 1960s—I found myself saying, “Please don’t kill yourself, don’t do it, policy will change, you’ll get home in a few years.” To then turn the page and see the two characters for suicide (zisha 自杀) was devastating. I walked away from my desk to clear my head. I finally convinced myself to return to work by telling myself that if the file had been pulped by paper recyclers or kept locked up in a closed archive, misguided notions or vague generalities about who did what during the Cultural Revolution would remain uncorrected. Grassroots archival materials are vital sources for writing the history of the Mao era not only because they add human color, but also because they have the potential to fundamentally shift the way we view the period.